SNOEL'S BLOG: Life goes on.. I've had a couple of great days skinning and skiing. 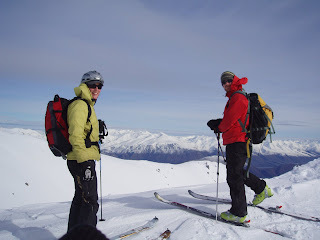 Firstly after the race Grant, Jane and I headed up the tows at Porters and skied from pt1997 down into Crystal Valley. This is fantastic steep terrain where a bit of width under boot probably paid off (for a change). 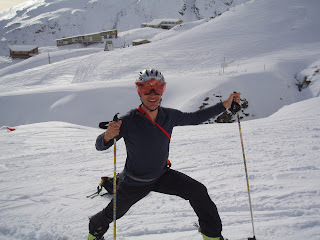 Then back up to the ridge and skied into the Goldney stream catchment for another 300m or so. Grant and Jane carried on and did a huge lap probably 500m, while I was content to do a shorter lap after the race. Today Grant and I went searching for a hoodie he had left at Temple last year! No luck, but we did manage a couple of laps, then did a bit of a transceiver search, which proved useful revision (especially for me). The photos are Grant and Jane above the Goldney catchment, and the 'blastshield' from the x wing sequence from star wars has found a new application!! That's me experimenting with a new stretching technique! But hey! I'm not wearing the race suit!